The novel and intriguing formation at Hod Hill combines familiar symbols in a new way to give us information that complements the Great Wheel formation at Buckle Street. It shows us how we can align with the Great Wheel of Life and which ways we can move. Two different-sized circles are connected by a straight line. The small circle, on the ‘outside’ of the large one, is surrounded by one concentric circle; the larger circle is also surrounded by a circle that contains a double-edged square that contains a simple labyrinthine pathway. All elements are connected by the pathway that leads to the labyrinth and back to the small circle. The basic symbols of circle, square and labyrinth in this formation come together to offer a complex message about the relationship and development of our consciousness within cosmic and temporal cycles of life and death. It gives us an insight into how personal consciousness may expand and flourish within the context of Creation. A circle with a centre often represents Creation, the Sun or consciousness. As we have here a small circle within a circle connected by a line to a large circle within a circle, perhaps this formation is referring to the individual in relation to the world, collective or Creation. The square is the quintessential earth symbol, a symbol for Man, and for the four elements making up the material world. Over millennia and in many different civilizations fourfold geometric shapes have symbolized the earth, the four elements and the four psychological aspects of man. The exquisite labyrinth formed by the three concentric partial circles around the large centre defines a pathway that goes toward the left, then to the right and back, or vice versa. For millennia, labyrinthine symbols have been carved in stone, drawn in caves and painted in temples. 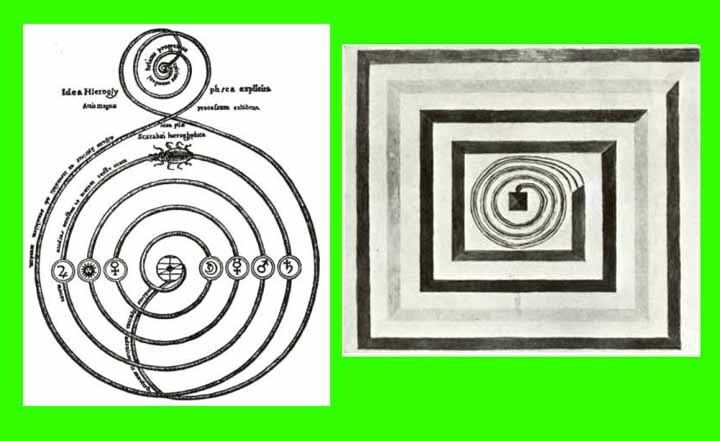 The labyrinth is ‘a perfect symbol of the individuation quest.’ (Stevens 247) It illustrates the ’soul’s journey into the centre of the uterine [unconscious] underworld and its return toward rebirth.’ (Walker 95) The labyrinth carries similar meanings to the spiral. Whereas the traditional labyrinth and spiral vehicles of consciousness describe specific paths, this amazingly ‘eloquent’ formation at Hod Hill shows us the many choices by which an individual might explore their connection to the world, life and spiritual development. Whether we choose the direct, perhaps meditative line, the peripheral all-encompassing line, the exploration of the material square paths, or the labyrinthine path of integrating the Masculine and Feminine, we are always in connection with other paths and may continue on our choice or move onto a different path, or perhaps at different times in our lives have a chance at all paths! The point made in this formation is that all paths for an individual are contained within the One and all paths are interconnected within the One. We cannot stray since we are constantly ‘within’. It is an invitation to expansions, explorations and adventures that can be pursued both within one’s own being and outwardly in the world. This new perspective on what it means to be a conscious human on Earth can be quite reassuring and liberating. It proposes many cycles of interest within the Circle of Life. In keeping with the name, Hod Hill we may become ‘hodders’ so to speak, building with the bricks and mortar of our own experiences, and fuelling the efforts with our own enthusiasm and understandings. Thus we too become co-creators in the Great Work on Earth. De Vries, Ad. Dictionary of Symbols and Imagery. North-Holland Publishing Co. Amsterdam. 1974. Hall, Manley P. The Secret Teachings of All Ages. The Philosophic Research Society, Inc. Los Angeles. 1977. Liungman, Carl G. Dictionary of Symbols. W.W. Norton & Co. New York. 1994. Stevens, Anthony. Ariadne’s Clue: a Guide to the Symbols of Humankind. Princeton University Press. Princeton. 1998. This did not become clear until we saw aerial images taken by Mat Gyro from a variety of perspectives (see www.youtube.com). How can we find a “10-10” message in the new crop picture? Well, it appeared on exactly the same day June 1 as a famous crop picture six years ago, which showed “pi to ten digits” using novel and clever mathematics (see www.dailymail.co.uk). By studying that 2008 crop picture, we can find a series of numbers “3, 1, 4, …” which relate to how many angular degrees were included, within each ratchet-like section of its outward spiral. 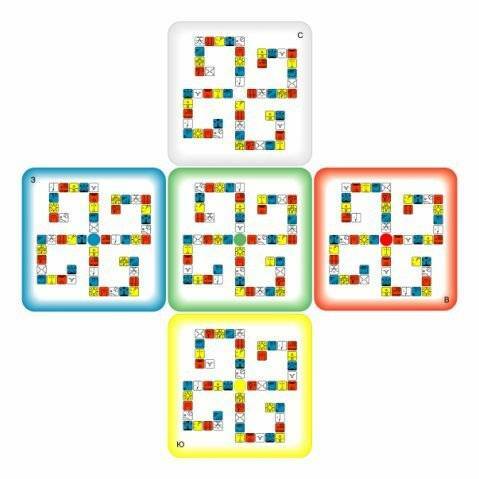 Starting from the centre and going clockwise, we find first “3” = 3 x 36o, then “1” = 1 x 36o, then“4” = 4 x 36o and so on. These three numbers make up the first three digits of “pi” as “3.14”. Now when we apply this same method to the 2014 crop picture at Hod Hill, we can see just two coded numbers. 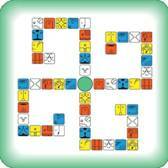 Starting from its centre, we find “10” = 10 x 36o by going clockwise for almost one full turn, and then another “10” = 10 x 36o by going counter-clockwise for almost one full turn. The two numbers are followed by a small dot for “stop”. 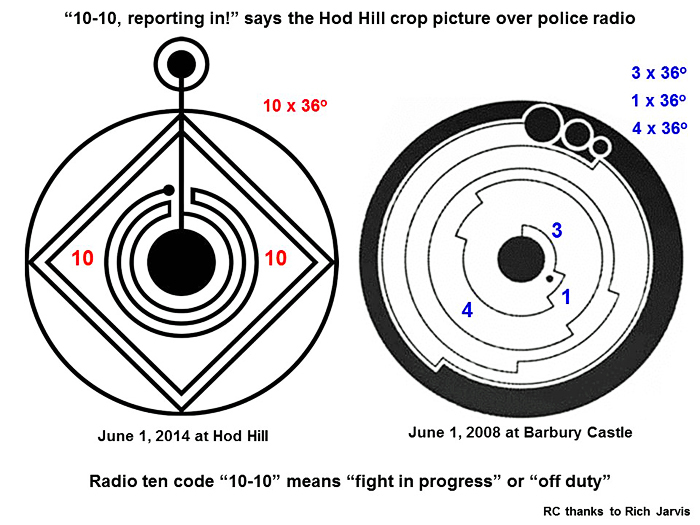 They may represent a well-known police radio code “10-10”, which can signify either “fight in progress” or “off duty” for different police departments worldwide. Once further events take place, then the specific meaning of this cleverly-drawn crop picture and its enigmatic message may become more clear. Chualar showed a “long tailed serpent” flying through the air (not shown in this schematic drawing), and being photographed by a “digital camera”. There is a Braille code at its centre for “1-9-2”, which can be read also in radio RTTY format as “Ea space”. A Morse code around its “camera chip” reads “ET B, MH B”. 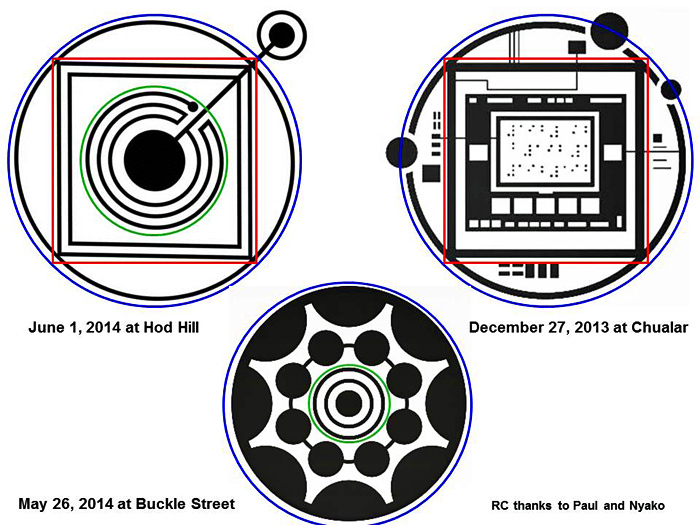 Likewise a “clock” outside of its “camera chip” repeats the cryptic date of “1-9-2” (see chualar 2013). More recently, Buckle Street showed what may be the “star extractor” from a revolver, as well as “airplane wheel” symbolism (see buckle street 2014). P.S. With thanks to Mat Gyro and Rich Jarvis, and in special memory of Mike Reed, who passed away on September 27, 2012. The crop circle of Hod Hill seems to show the path to enlightenment. 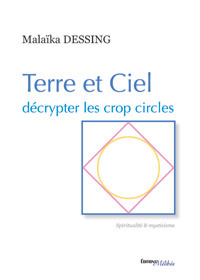 It reproduces the cover of my book published in French « Terre et Ciel : décrypter les crop circles » (Editions Mélibée, 2013). The design derives from sacred geometry, but with few additional details that concord with the conclusions of this book. It is a therapeutic tool. Based on a measure of the level of (subtle) energies of crop circles, I was able to identify thirteen categories, recognizable by their motive, and link them with chakras, some stars, colors, musical notes, etc. This grid forms a « system of stellar resonances », and is opening us to the Universe. It is leading beyond the Tree of Life, which is restricted to our solar system and the nine planets. A striking feature is that these thirteen categories of crop circles seem to draw the path to enlightenment, or connection to the higher levels. 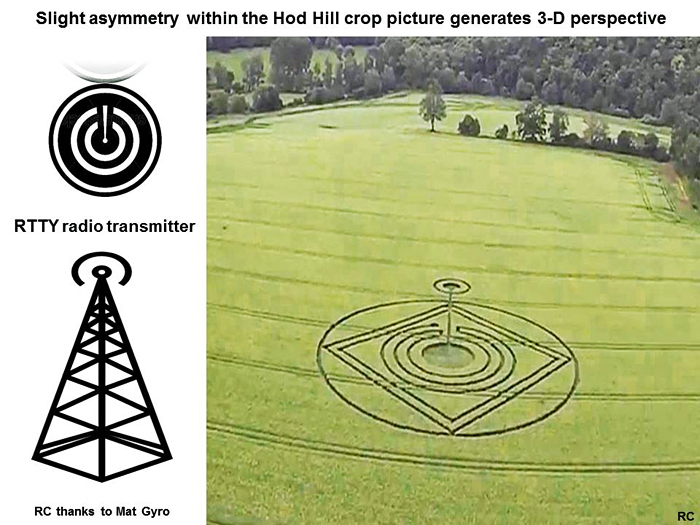 The crop circle of Hod Hill shows how. The thirteen categories I have identified do not follow in increasing order, when looking at their motive and association with numbers (1, 2, 3, etc. ), but appear to combine three sub-paths : the Feminine, the Masculine and the path of the Child of ancient Egyptians. Geometric figures are rich in meanings. One interpretation is to associate the Feminine with the circle and the Masculine with the square. Hence, starting at the point in the middle of the crop circle of Hod Hill, and following the line, one is swinging back and forth on either sides through the conundrum (between Masculine and Feminine), to end up again in the middle (on the path of the Child), that leads out of the circle, presumably to the higher dimensions. Crop circles, and my book, thus become a therapeutic tool. However, subtle energies involved are very powerful and particular, as measured by quantum instruments. They must be handled with care. This book can be ordered (in French), with an assessment in English of the chakras and some explanations of how to work with these energies. The offer is valid until September 2014, through my project of crowd funding, to boost my start-up of healer: www.100-days.net/en/projekt/humanist-psychs. Past that date, it will still be available on my web site : www.mdessing.drupalgardens.com. This crop circle appeared on 1st June 2014. On 27th May 2014 began also the Green Central Castle of Enchantment, which ends on 17.07.2014. I think the square on the pictogram symbolizes the Green Central Castle of Enchantment and in the square are depicted the 4 wavespells of this castle. In the same way that a Wavespell can be understood as a “week”of 13 days, a Castle can be seen as a “month” of 52 days. You can see below what the castles represent and which Wavespells each contain. The cyclical interaction in the Galactic module Tzolkin reflects the travel of the Galactic creature in the time. It has to go through all 5 stages of the evolutionary path, corresponding to the 5 castles. The Green Central Castle of Enchantment is the Court of Synchronization. The Green Castle of Enchantment, a synchronization conducive for Earth Wizards to enact Planetary Magic. In the Central Castle of Enchantment, which is in the center of the Time Matrix, the Human of Free Will synchronises himself through the energy of the Enchantment and transforms himself due to the Synchronic Order of the Universal Time. Red Moon, White Wind, Blue Eagle, Yellow Star. Wavespell of the Red Moon: The initial water initiates the Enchantment. Wavespell of the White Wind: The Spirit purifies the Enchantment. Wavespell of the Blue Eagle: The vision transforms the Enchantment. Wavespell of the Yellow Star: The elegancy helps for the ripening of the Enchantment. 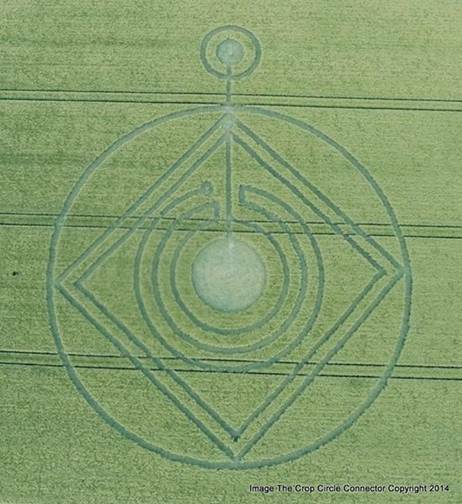 This crop circle appeared on 1st June 2014, this is a day with the Solar Seal “White Wizard” and the Tone 6, Kin 214. Maybe this day has been choosen because of the meaning of this Solar Seal. The Solar Seal “White Wizard” has the following meaning: Enchanting, Timelessness, Receptivity. So we see that on this day we have the energy of Enchanting which coincides with the name of the whole Castle - the Green Castle of Enchanting. On 1st June 2014 we have the Tone 6, so the Guiding Energy conincides with the Solar Seal, i.e. the Energy of Enchantment doubles. On 1st June 2014 we have the energy of Enchanting coming doubled from the Solar Seal of the day and from the Guiding Energy, plus from the Green Castle of the Enchanting, so this energy triples ;-). The crop circle appeared in the Year of the Yellow Galactic Seed. This year began on July 26, 2013, and ends on July 24, 2014. The Green Central Castle of Enchantment ends on 17.07.2014, so it ends almost with the Year of the Yellow Galactic Seed. The Human, here symbolically depicted as a yellow seed (we are in the Year of the Yellow Galactic Seed) begins his journey in the 4 wavespells of this castle. At the end of this castle the human goes out as a riper Seed of Consciousness and is ready to begin the next cycle, to enter the first castle of the next Tzolkin - the Red Castle of Birth.